I had the pleasure of attending a special screening of Resilience (나를 닮은 얼굴) this week and I'm pleased to say that those of you who have some free time next Wednesday afternoon can get the opportunity to see a special screening at the Cine Code Sonje Theater in the Art Sonje Center. Resilience will be shown on Wednesday 22nd September at 2.00 pm. Tickets are 7,000 won and you can get more info by calling 02 730 3200. For directions to the cinema click here. It's a heartbreaking documentary following an adoptee as he meets his Korean birth mother for the first time in thirty years and as they tried to rebuild their relationship as a family. Well worth a watch. 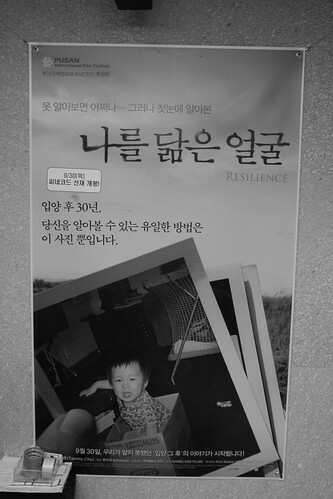 Resilience has Korean and English subtitles.